I admit that I don't eat a lot of salad. My salad has to be exciting and full of contrasting flavors and textures. This salad fits the bill. I am catering a holiday dinner for a company where many of the guests are vegetarians so I want to come up with a salad good enough for me to eat that is vegetarian or even vegan! On top of that it uses seasonal ingredients and has to be beautiful! I love persimmons but have never used them in a salad but their sweetness should work well with peppery arugula. Choose a nice firm persimmon, using a mandolin to shave it thinly, about 1/8 inch thick. It's important not to use a ripe (soft) persimmon and not to slice it too thinly so it will not retain its shape once pickled. If you don't have a mandolin, slice it as thin as you can. Remove the seeds if it has them. Place your persimmon slices in a bowl, add 1 tablespoon red wine vinegar, 1 teaspoon maple syrup, and salt to taste. Gently mix them together well. Let it sit for 10 minutes, then strain the persimmon slices and save the marinade. Then use the marinade to make dressing by adding a tablespoon of olive oil, salt and maple syrup to taste, plus 1/2 teaspoon of coarse ground mustard, blend well to emulsify the dressing. Now you are ready to put the salad together. 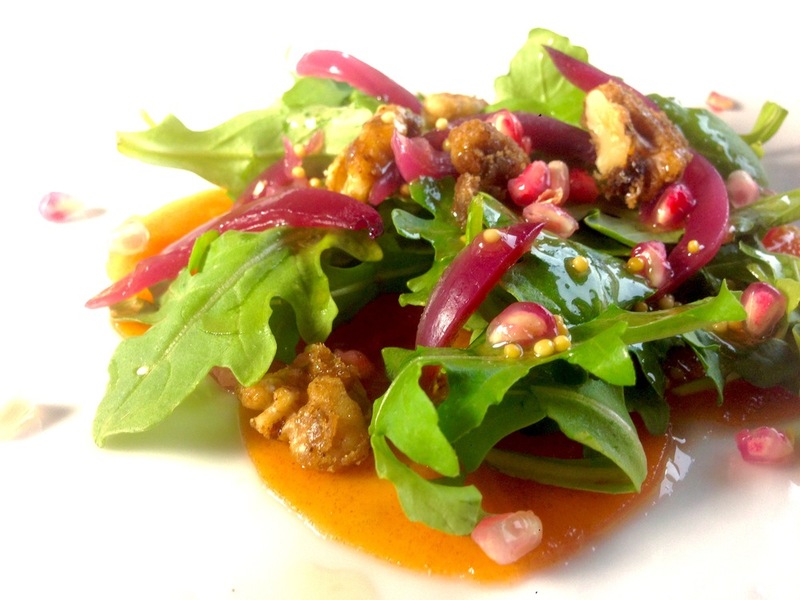 Arrange persimmon slices in a thin layer on a plate, top with a couple handfuls of arugula, party nuts (see my other post on that), pickled red onion, pomegranate seeds, and drizzle with the dressing on top. This should serve two people generously as a salad course. To me everyone should have some pickled red onion in the fridge. It adds a bright acidic flavor to any dish you make. I am an impatient cook so I make mine using quick pickle method with my commercial chamber vacuum sealer. But don't let that stop you. You can make pickled vegetables the traditional way. In a small sauce pan, boil 1/4 cup red wine vinegar, with 1 1/2teaspoon of kosher salt and 2 teaspoon white sugar. Add 1 medium size red onion thinly sliced to the vinegar mixture. Boil it for five minutes, turn the heat off and let the onion steep in the vinegar for a least a couple of hours before using. Left over pickled red onions stay fresh several days in the fridge.